Supernatural 10x14 "The Executioner's Song"
After some more lighthearted episodes, it's back to business this week. Finally, the showdown with Cain. But wait, you say, wasn't Cain okay before? Wasn't he just holed up on a farm somewhere? Well, as the saying goes - that was then, this is now. Because Cain has succumbed to his darker urges. He's been taking out murderers and other evildoers across the globe, centering around those that have descended from his bloodline, because it's all tainted and such. But that means he's starting to leave a trail, one the Winchesters pick up on without knowing it's his at first. Castiel has also managed to track him down after some tortuous bits with a demon, wherein he learns about his agenda. Of course, Team Free Will, which I suppose is still relevant even now, is not so into Cain's idea of a culling of the bloodline, particularly when next up on the list is a boy of twelve who just happens to be the son of a murderer. Thing is, Cain's pretty dang strong. The only thing that can kill him at this point? You guessed it - the first blade. 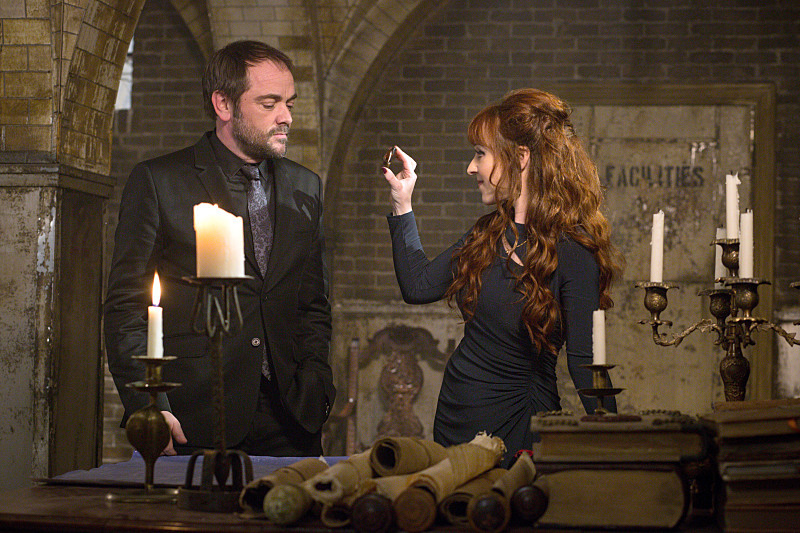 Which means the team is going to need Crowley to bring it on over to them. He's still hanging out in his bunker of sorts, bored to tears despite his mother actively trying to manipulate him into helping her kill some grand coven mother. He doesn't seem easily fooled by her, but then again, she does have a way at touching at his sore spots. One of which happens to be that he's helping the Winchesters when they wouldn't do the same in return. But Crowley isn't having none of that, particularly not after Dean tells him he's on Cain's kill list (even though he isn't), so he heads off, blade in tow. The whole gang is ready for their trap for Cain, using the kid he wants to kill as bait. Or, pretend bait, as they use an illusion spell thing Rowena was going to use for something else to make it just appear like the kid was there, and trapping Cain in a devil's trap. Which means it's time for Dean to take up the blade and go meet his "maker." Dean gets beat around quite easily, even with the blade in his hand. Cain manages to get the blade away from him, and does the one thing all villains should never do - pontificates about how he's saving Dean from going truly dark side, because he believes that one day the Mark will take over, and Dean will end up doing what Cain did - kill his brother. Well, today is not that day. Dean manages to use Cain's own knife against him, cutting off his blade-wielding arm. 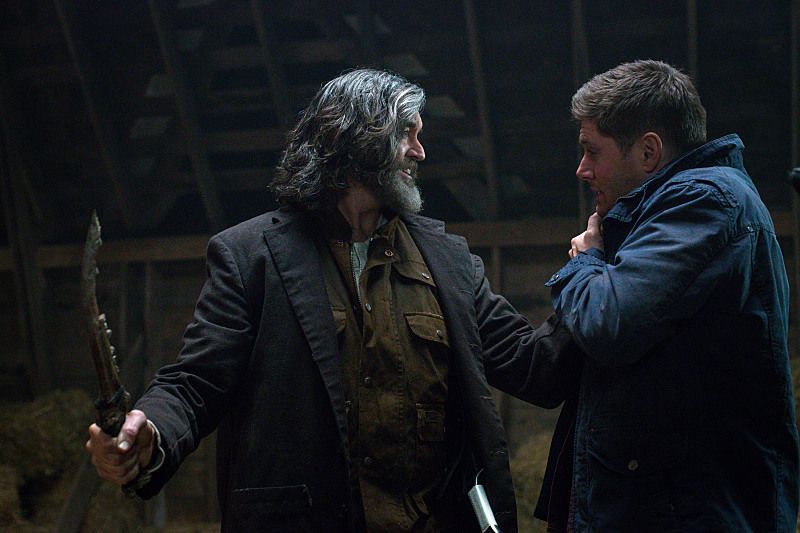 So we must then bid farewell to ole Cain, as Dean has no choice but to use the blade on him when he says he'll never stop with the mad killing stuff. Slightly anticlimactic when you compare this scene to another where Dean is confronting a big bad demon - On the Head of a Pin, anyone? Dean doesn't let the blade overtake him after their confrontation, but he doesn't give the blade back to Crowley like he said he would either. Instead, he gives it to Cas, who hides it in points unknown, leaving Crowley to go home and be berated by his dear mum for, you know, being a terrible King of Hell and all. Meanwhile, back at the bunker, Dean is putting on a brave face, and so is Sam, but neither of them seem all that optimistic about Dean's prospects. In case you couldn't figure that out, Sam spells it out for us by telling Cas that Dean's in trouble. You think? - Was anyone else a bit distracted by some of the music in this episode? It seemed to be a bit loud in some of the talking scenes. Maybe I'm just nutty. - I mean... I kind of wanted more from a showdown between Cain and Dean. Like, a lot of build up for not a lot of reward here. And it was kind of... melodramatic? I suppose maybe because we know Dean is going to get out of this Mark business somehow that all of the near tears feels little like yeah blah blah okay. Or maybe I'm just being cynical, who knows. - Does anyone know what the heck Cas' goal is for this season apart from helping Dean? There was that whole bit with Hannah earlier rounding up wayward angels, but is that still his thing? The even bigger question: do we care? - Similarly, what the heck does Crowley want? I suppose that's sort of what he's trying to figure out, as he's so very clearly bored of his day to day King duties. But he needs to get some kind of goal, stat. - Now the show is taking a bit of a break until mid March, when it moves back to... Wednesdays. Good? Bad? No difference? Dean: Bass fishing, needlepoint, that's a hobby. Collecting serial killer stats, that's an illness. Cain: I prefer to be thorough. Well.. I found the Cain and Dean scene disappointing. I thought they would fight, Dean would be overwhelmed by the blade either during the fight or after since it´s been a while for him to kill with the first blade. But no, instead he manages to keep his cool and had it over to Cas without any hesitation.That was really disappointing to me. Then next episode, after a looooong break, we see the boys back in business - which would have been great unless it was for last nights ep - how can Dean just go back and hunting? We don´t know what happens during ep.15, maybe we´ll see that the fight actually had an impact on Dean, after all he was clearly not fine. But knowing SPN, they give us a couple of minutes or some what more with Dean acting or being different (like that smile walking up the stairs, EPIC!) but that´s that. Then they give us a filler or two, maybe three, and then Dean´s acting weird for a whole episode. Can´t they just.. for once focus on Dean longer? Like they did with Sam´s problems over and over again? This storyline is so good, and they are ruining it by giving us and Jensen way to little action by it. Before we know it he will be cured. I have high expectations for the episodes that are yet to be shown, and I hope.. like really dark, that Dean goes ballistic. Like Sam said "Dean´s in trouble" okey... so let US SEE IT! Not just HEAR about it every now and then. Other than that, applauds for Jensen and Tim´s amazing acting tonight!!!! Yeah I wanted more from the Cain/Dean fight as well. Cain just seemed to toss Dean around, which I guess was supposed to be the point, that he was outmatched, but I still wanted to see them actually sparring a bit more. A lot of people are also speculating that Cain isn't really dead as they didn't actually show him die. Not sure whether I believe that one or not, but it was a little ambiguous.